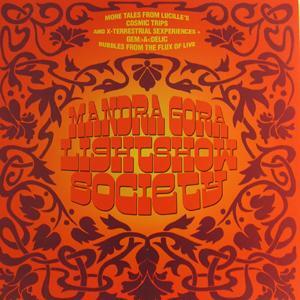 Mandra Gora Lightshow Society - "More Tales From Lucille's Cosmic Trips and X-Terrestrial Sexperiences + Gem-A-Delic Bubbles From the Flux of Live"
Does the title of this slab of wax give you an indication of what the music is like? You bet it does. Over 40 minutes of monstrously spaced out psychedelia across two LP sides. Three of the tracks were recorded live at the Suphur Sonic Open Air festival in Germany in 2004. "Charly" is an awesomely tripped out psychedelic tune, with fuzzed, deep space liquid guitars, organ, and acid jams galore. "Like No Other One Here" and "Mary Mary" are both catchy songs with cool jamming grooves that throughout their 10+ minute lengths take off into space for some tasty rocking instrumental psych jams, with a guitar and organ combination that will sweep you back to the 60's. These guys really know how to rock out and freak out, while retaining a seriously body moving rhythmic grooving pace. "Floating at the Gate of Dawn" is a 15 minute jam with Nik Turner recorded at the 12th annual Hawkfan meeting in Germany. Veteran Mandra Gora fans will already be familiar with this as it's been released a couple times, first on the Liquid Sound Records CD reissue of Beyond The Mushroam Gate, and then on the CD compilation - Lucile's Grotesque Diary Of... ( )... Psychotic Love Throughout The Galaxy. But it's an outstanding space jam and very nicely rounds out this vinyl edition live set. Now…. all we need is a long overdue new studio album! For more information you can visit the Mandra Gora Lightshow Society web site at: http://www.mandra-gora.de. Visit the Psych-Out Records web site at: http://www.psychout.it.